Posted on January 2, 2014 by Hillary T.
Stormy winter weather could drive even the hardiest souls indoors. Our feathered friends don’t have central heating or a cozy fireplace to retreat to, though. Fortunately, birds have a number of amazing adaptations and savvy strategies for surviving the worst that Old Man Winter can throw at them. Mass Audubon’s Bird Conversation department shares ways birds cope with storms. A common recurring theme in folklore is that animals can sense coming changes in the weather. In the case of birds, at least, this appears to be the case. Birds can sense a coming storm because of their sensitivity to changes in barometric pressure. This gives them time to forage for enough food to last them through a period of inactivity and to find shelter. The exact method by which birds can detect changes in pressure while we humans cannot is not fully understood, but a special organ in the middle ear called the para-tympanic organ (PTO) is believed to play a role. Just like people, many birds seek shelter from bad weather. High winds and soaking precipitation make for bad flying conditions, so most birds choose to sit tight and wait out the storm when they can. Many birds, like chickadees and woodpeckers, will seek out the same tree cavities and other nooks that they might use for nesting during other times of the year. Other birds will retreat into dense foliage, especially evergreen foliage that retains a protective shield of leaves even in winter. Some of the hardiest birds will continue foraging even through snow, rain, and freezing conditions. It’s not unusual to see huge flocks of gulls standing or sitting on frozen ponds during days when the cold and wind drive most humans indoors. Many birds (like gulls, ducks, and geese) that stand or sit on ice or freezing water for long periods have a counter-current heat exchange system running through their legs. Simply put, warm blood being pumped from the body’s core in arteries passes very nearby cold blood traveling back up through the veins. Heat diffuses from the arteries to the veins, warming the blood up before it enters the bird’s core and cooling the blood down before it reaches the foot. By keeping their feet just above freezing, birds vastly reduce heat loss. A bird’s feet are very spare structures: not much but skin, bone, and sinew. This simple structure, devoid of energy-hungry tissues, helps the foot survive cold temperatures without permanent harm. Anyone who has worn a down jacket knows how effective feathers can be at trapping air and keeping you warm, and birds use this insulation to create pockets of warm air next to their skin. When an exposed foot or leg does get too cold, many birds will pull it up into their feathers to sit next to the body and warm up. They may also tuck other featherless areas (such as the bill) under their wing to minimize heat loss that way. Even small perching birds like juncos will use these strategies—a foraging junco will often stop and crouch for a few seconds, bringing its feathers down over its feet and allowing them to warm up. Look for this behavior the next time you’re out on a cold day. Many birds that have very high metabolisms cannot survive New England winters, so they migrate to warmer climates. But what happens when a freak cold snap or an unseasonable storm drops the temperature beyond these birds’ comfort zones? Birds like swifts and hummingbirds have the ability to enter a deep sleep called torpor. Much as with hibernation in mammals (in fact, hibernation is a type of torpor), a torpid bird uses much less energy and can survive a drop in its body temperature that would quickly result in death if all systems were still trying to run full-tilt. Once the storm or cold snap passes and the temperature warms up again, the torpor ends and the bird can resume foraging. This entry was posted in Nature Notes and tagged birds, winter on January 2, 2014 by Hillary T..
Great article. We have feeders out front of the house near the wood pile. No one disturbs them for hours, even days. If I sit in the car down near to the wood, I can watch the birds come and go. They don’t see me and patterns appear. Birds fly from the bramble bushes to the feeder and back, some fly to and from a thick fir tree. They are always wary and never sit still for long. It all makes sense if you just slow down to watch. I have 3 bird feeders because we have about 6 inches of snow here in Idaho where i live and I have to fill them everyday!!! I mainly just get sparrows, juncos and dove. This morning around 11:00 I checked and not a bird anywhere!!! I thought it was very strange and an hour or so later we had a snowfall of an inch or so and soon after the sun was shining. And the birds were back as normal which brought me to wonder if they sensed the snow was coming!!! I decided they must have!!! Good to know !!! 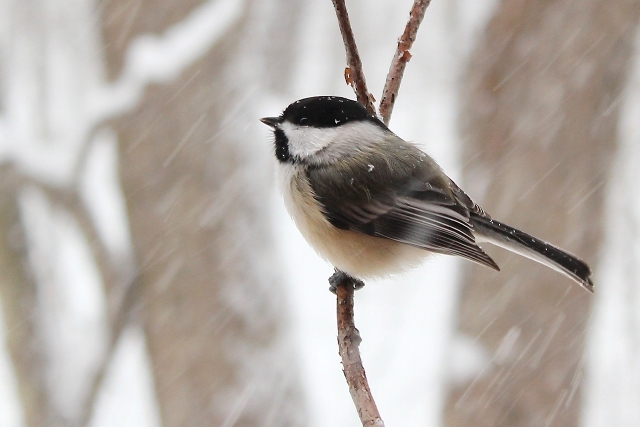 Beautiful photo of a black-capped chickadee! Fascinating about how they keep their feet from freezing, I always wondered that. Very interesting article; we have a lot of the bird in the picture at our feeder, what is it? It’s a black-capped chickadee, which happens to be the Massachusetts state bird.